Is presidential popularity related to type differences? There seems to be some evidence that it is. Two models in the literature that currently link politics and political preferences to individual psychological differences are those of John Jost (2006) and Jonathan Haidt (2012). Jost summarizes a range of studies that suggest a link between liberalism (the Democratic party in America) with what in Jungian terms would be called intuition and perception, versus a link between conservativism (the Republican party in America) with sensation and judgment, though he used a non-Jungian personality framework in his writings. Haidt suggests that liberals and conservatives use different so-called moral foundations, which emphasize either individual autonomy or communal “binding.” I have argued elsewhere (Embree, 2013) that these moral foundations have strong links to Jungian type differences, also suggesting a link between Intuiting, Feeling, and perceiving (NFP) and liberalism on the one hand, and Sensing, Thinking, and judging (STJ) and conservativism on the other. Each cycle in the Strauss-Howe model can be divided into four approximate seasons, which they name after the seasons of the natural year: the Spring or High, a post-crisis time of affluence and social stability (but also cultural sterility, conformity, and intolerance for deviance); the Summer or Awakening, a time when adolescents and rising adults question the values of the previous season; the Autumn or Unraveling, a time when the social fabric appears to lose its needful cohesion and the culture splinters into various forms of tribalism and polarized factions; and the Winter or Crisis (as defined in the previous paragraph). The “warmer” seasons are times of high (sometimes excessive) social order, the “colder” seasons are times of low (sometimes desperately insufficient) social order. During the full saeculum, the culture cycles from an emphasis on collectivism and conformity to an emphasis on individualism and autonomy, then back again. It is of interest that spiritual awakenings or value transformations in the culture (like the First and Second Great Awakenings, the Transcendental Awakening, and the Consciousness Revolution) inevitably peak halfway through a saeculum. Four generations can thus be defined in terms of their place in the cycle—the historic season of their birth. The characteristics of these four seasons correspond approximately to the four temperaments of David Keirsey. While the relative frequency of different personality types probably does not change from generation to generation, the cultural influence of different personality traits does vary across the generations, as noted below (see also Embree, 2000). Thus, individuals of a given generation whose personality traits are culturally ascendant at the time get a “double dose” of these traits (their generational culture amplifies and rewards them). While not all members of a given generation will have the prototypical traits suggested by theory, if even two-thirds of the cultural leaders of a generation do, this is sufficient to give each generation its own unique flavor. Adaptives, born in the Winter of the cycle (like the children of the Great Depression, a.k.a. the Silent Generation), are typically cooperative and tolerant, but conformist and risk-averse. Growing up at a time of maximum threat to the survival of the culture, as children these individuals learn to respect authority, follow the rules, know their place, and band together with others. Outer-directed and focused on the virtues of rule-following and attention to community reputation, these individuals develop traits reminiscent of the Sensing-Judging temperament (Guardians). As a sidebar, it is interesting that the Silent Generation is the only generation in United States history never to have had a president selected from among its ranks. Idealists, born in the Spring of the cycle (like the Boom generation), are typically individualistic and spiritual, but unrealistic and dogmatic. Growing up during a post-crisis cultural high, as young people these individuals tend to see the culture as being sterile and unnecessarily conformist, and rebel against these trends, fueling a “generation gap” and a youth revolt (as in the 1960s). Inward-looking and focused on the subjective, these individuals develop traits reminiscent of the Intuitive-Feeling temperament (Idealists). Reactives, born in Summer (like Generation X), are typically entrepreneurial and strong, but cynical and risk-prone. Growing up in the aftermath of the spiritual awakening or spiritual transformation, these children often feel that their parents were too busy saving the world to pay attention to them, and perceive themselves to have been under-protected, forced to grow up too soon into a world unraveling before their eyes. Through no fault of their own, they tend to be stereotyped as “bad” kids at a time when the culture is maximally hostile to children. Focused on immediate rewards and issues of pragmatic survival, these individuals develop traits reminiscent of the Sensing-Perceiving temperament (Artisans). Civics, born in Autumn (like the Millennial generation), are typically results-minded and team-oriented, but unreflective and linear. Raised by mostly Reactive parents who pledged to overprotect their children (in a reaction against their own under-protected upbringing) and who thus become “helicopter parents,” these children feel entitled and special, and learn early to work collectively to address social problems, first locally (as in youth-driven initiatives like “Make a Difference Day”), later globally (as when the “Greatest Generation” fought and died on the beaches of Normandy to save the West from the menace of Hitler). Focused on mobilizing to deal with external threats, and often the most rationalistic and technocratic of the four generations (note the recent rise of smartphones, social media, and the like), these individuals develop traits reminiscent of the Intuitive-Thinking temperament (Rationals). Note that generations born half a saeculum apart tend to have opposite characteristics. For instance, the worst social pathologies in the public schools when Adaptives were young adults involved infractions like chewing gum in class; half a saeculum later, young Reactives had to pass through metal detectors on their way to the classroom to stem the flow of assault weapons. Young Idealists were anti-war protesters, and forty years later, young Civics were being celebrated by the culture as military heroes. An anecdote from my own experience as a teacher is telling. One day I was late for class and I arrived to find a totally dark classroom filled with students. Turning the light on, I reminded the students that they could have activated the light switch for themselves. “No, that’s your job,” they said; “We didn’t want to presume.” My response was that when my generation was their age, we not only turned the light on, we burned the building down. In his recent book The Next America, Paul Taylor (2014) takes an in-depth look at the fundamental differences between Boomers (the current Idealist generation, in Strauss-Howe parlance) and Millennials (the current Civic generation). As noted earlier, it would be expected that these two generations would have starkly opposing characteristics, and Taylor’s work, which is grounded in a plethora of empirical (social survey) studies conducted by the respected Pew Forum group, strongly confirms this notion. Taylor chose to examine these two generations in part because they are the most statistically numerous in modern America—Millennials because they are the rising adults, and Boomers because of the unusual size of their birth cohort (born in the aftermath of World War II). Both Boomers and Millennials have had a strong impact on contemporary culture, as Strauss and Howe would predict (based on their belief that Idealists and Civics in each saeculum are more influential than are Reactives and Adaptives). “Young and old in America are poles apart,” writes Taylor (2014, p. 29). Compared to aging Idealists in today’s America, young Millennials are more ethnically diverse (and more tolerant of a range of subcultural differences), more politically liberal, more optimistic (despite the fact that their present economic outlook, in the aftermath of the Great Recession of 2008, remains dire), less conventionally religious, more technologically savvy, and less sanguine about American exceptionalism, just to note a few key findings. Taylor notes that the “voting gap” between young (under age 30) and old (over age 65) voters has never been greater in the 40 years that the Pew Forum group has collected data on this question. Taylor notes in passing that conclusions about generational differences must be drawn carefully, since they are easily confused or conflated with developmental (age-related) differences. It is thus of interest that both Jung and the Strauss-Howe model argue, in their own different ways, that individuals seek balance between opposing traits throughout the developmental pathway of their journey from womb to tomb. Jung wrote: “The afternoon of life is just as full of meaning as the morning; only, its meaning and purpose are different” (1953/1972, para. 114). Analogously, Strauss and Howe argue that this principle of enantiodromia, the tendency to move from one psychological extreme to its opposite, governs the manner in which each generation ages: the characteristics that dominate in youth are counterbalanced by a late-life reversal. Thus, they argue, risk-prone young Reactives age into conservative if not reactionary elders, while risk-averse young Adaptives become liberal experimenters in old age. Freedom-celebrating young Idealists tend to become moralistic if not dogmatic elders, while team-minded and self-sacrificing young Civics often focus on their own individualistic needs and concerns in old age. This model allows younger readers of Strauss and Howe’s work to make general predictions about what their later life may look like. For instance, my (Idealist) generation can look forward to becoming “Grey Champions,” highly respected but financially impoverished elders (note concerns about the possible impending collapse of the Social Security trust fund) who are arbiters of moral and spiritual values for the culture. Paradoxically, the more historically blind and future-oriented a culture is, the more dramatic the seasonal turnings of the saecular cycle, Strauss and Howe argue. This may explain why linear, unreflective Americans are so often surprised when the future does not look like the past. For instance, few of those celebrating during one of the many millennium parties held on January 1, 2000, would have predicted that, within two years, America would have been attacked by terrorists and plunged into a massive war in the Middle East that is still fomenting global crises more than a decade later. Superimposed onto the world of presidential politics, the saecular cycle may be reflected in terms of an oscillation between a weak and a strong presidency (relative to other balancing institutions such as Congress). Fineman (2008) argues that we have moved, in the past 40 years, from a relatively “invisible” presidency (Carter) to an “imperial” presidency (Bush II and, by extension, Obama). He notes that presidents tend to be strongest (Washington, Lincoln, FDR) in times of major war, which in terms of the Strauss-Howe model means the Winter or Crisis season. The question is: Are these tendencies reflected in popular media descriptions of successful presidential candidates over the past five or six decades? For the purpose of this study, the ten U.S. presidents from John F. Kennedy to Barack Obama were analyzed (conveniently for the purposes of the analysis, this roster included five Democratic and five Republican presidents). The 48-year-long time span (from Kennedy’s election in 1960 to Obama’s first election in 2008) is long enough to encompass the modern era, and comprises about two-thirds of the Strauss-Howe saecular cycle. There is no consensus among historians as to what might comprise the “modern” era in U.S. politics, but based on the most recently published Census Bureau data, about one in five (19.2%) of living Americans today have autobiographical memories of the Kennedy administration. In addition, Kennedy’s presidency was widely seen at the time as “passing the generational baton” and as launching a new phase in political history, and is still seen by many in that light. The adjectives derived from the Time archives were then reordered to avoid priming or other biasing effects and then classified in terms of their linkage to the Jungian preference dimensions, following in the tradition of experts in typology such as Hammer and Kummerow (1992) and Pearman and Albritton (2010). Each adjective was classified as belonging most closely to one of the four MBTI® preference categories (extraversion/introversion, Sensing/Intuition, Thinking/Feeling, judging/perceiving), or if none of these categories were evoked by a given adjective, it was rated as Unclassifiable. For instance, the term animated was categorized as belonging to the Extraversion category, restrained was linked to Introversion, common-sense to Sensing, change-minded to Intuition, competitive to Thinking, compassionate to Feeling, certain to Judging, and spontaneous to Perceiving. Representative unclassifiable terms were benign, competent, controversial, and experienced. My research expectations in this study were threefold. First, it was expected that Republicans would be more oriented toward Sensing, and Democrats toward Intuition. Second, it was expected that presidential traits would oscillate over the decades between a relative emphasis on Sensing and a relative emphasis on Intuition (reflecting the influence of the Strauss-Howe cycle). Differences in other type dimensions were not specifically expected, though a few emerged as noted below. Third, though most difficult to capture using the methods of this study, it was expected that an oscillation between “strong” and “weak” presidents might emerge from the data in the study. Overall, Feeling traits were the most common (18.0% of all traits), followed by traits related to Extraversion (15.0%), Intuition (12.8%), and Judging (12.6%). Presumably, over the 48-year period examined, the American electorate preferred candidates who manifested E, N, F, and J traits over their I, S, T, and P opposites. However, the role of both political partisanship and of historical cyclicity strongly modified this general tendency. Looking at partisan differences, Republican presidents are likely to be more Sensing, while Democratic presidents lean more toward Intuition (r = -0.564). Democrats also tend to be more Extraverted than Republicans (r = +0.344). Anecdotally, this connection can be traced as far back as “Silent Cal” Coolidge, whose Introverted and Sensing tendencies were almost archetypal in their clarity. It seems that voters with different partisan leanings seek different traits in candidates whom they would support—not a huge surprise. I was also interested in the question of whether presidential popularity was related to typological differences. To identify some outcome variables for use in this comparison, I looked at the Siena College ratings of U.S. presidents, reversed so that higher values indicated “better” presidents; Electoral College and popular vote results for each president’s first election (for Ford, no such data existed since he was appointed but never elected); and the Gallup first-term presidential popularity averages. A positive correlation was obtained for each pair of outcome variables, from a low of +0.150 (between Electoral College results and Gallup popularity ratings) to a high of +0.616 (between Electoral College results and popular vote results). While the Siena College ratings tended to be skewed slightly in favor of Democratic presidents, they also showed strong positive correlations with the other outcome measures in the study. Of particular interest to me was a potential relationship between presidential traits and the Strauss-Howe historical cycle. Theory would predict a “sine-wave” pattern over eight decades. Since a shorter time frame (about five decades) was examined in this study, about two-thirds of such a pattern should manifest itself in the data if the Strauss-Howe model is valid. The impact of partisan differences would have to be separated out in order for this pattern to become evident. The figure below represents the results of this analysis. In the graph, the years from 1960 (Kennedy’s election) through 2008 (Obama’s first election) are depicted on the horizontal axis. The vertical axis represents the balance between Sensing and Intuitive traits as used to describe each of the ten presidents in the Time archives: positive number scores (toward the top of the graph) represent a relative preponderance of Sensing traits, while negative number scores (toward the bottom of the graph) represent a relative preponderance of Intuitive traits. The standard colors that have become nearly universal in American political discourse over the past few decades (red=Republican, blue=Democratic) are used to present historical trends for presidents of each party separately. 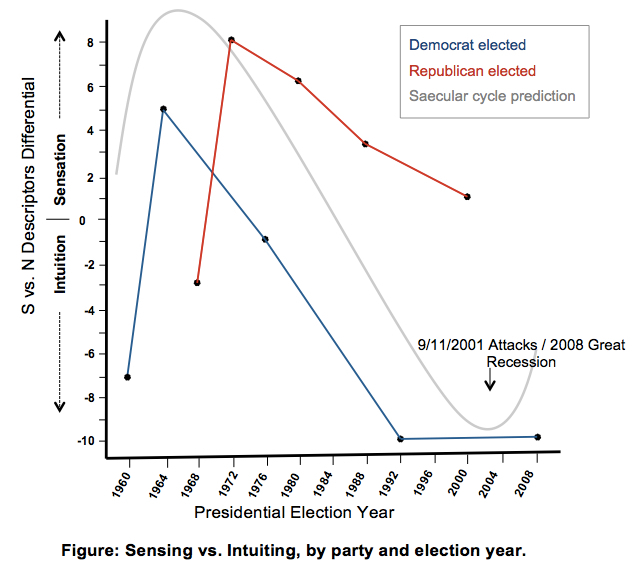 First, independent of the historical cycle, Republican presidents tend more toward Sensing, while Democratic presidents tend more toward Intuition, as predicted by theory. (This calls to mind G. K. Chesterton’s famous remark, “The job of liberals is to keep making new mistakes, while the job of conservatives is to make sure that old mistakes never get corrected.”) This in turn suggests (though the data of this study do not directly prove) that Sensing voters would be more inclined to favor Republican candidates, and Intuitive voters to favor Democratic candidates, on average. Second, the curve lurches strongly toward Sensation and then moves back toward Intuition over the five decades examined. This matches the Strauss-Howe model, though the timing of the shift toward Sensing initially appears to be mistimed. One explanation for this apparent mistiming involves cultural lag, in which it takes time for the natural tendencies of voters (especially younger voters) to permeate the political landscape. Strauss and Howe themselves allude to this lag in The Fourth Turning: “From his [Nixon’s] constant appeals to a Silent Majority to his closet profanities to his famous image of walking on the beach in a suit, he was a saecular anachronism, a First Turning man trying to lead a Second Turning nation” (p. 307). Of course, what was true of Nixon (one of our most controversial presidents, certainly) may not be true of the rest, but the general principle may hold. In general, it may be that the public prefers Sensing leadership during the early years of the Strauss-Howe cycle when they can relax and enjoy good times (that is, indulge their own Sensing), but prefers Intuition during the later years of the cycle when they have to batten down the hatches and prepare for hard times (which involves, in part, harnessing voter Intuition). Generational voting patterns (cited by Strauss and Howe in their work, and also as available in public venues like Gallup and Pew Forum) suggest, for instance, that Reactive voters tend to be conservative while Civic voters tend to be liberal or progressive. See, for instance the Pew Research Center’s summary in which the argument is made that Obama’s election in 2008 was due in large measure to disproportionate support from Millennial (Civic) voters. Though suggestive, the findings in this study are open to various confounds. One involves the chosen methodology, in which presidential type was assessed in terms of public image and persona (as reflected in media depictions). Not only may a person’s outward image not be fully reflective of their true underlying self (especially for Introverts), but the media—even a news-magazine as respected as Time—may not perceive candidates of both parties with equal unanimity and objectivity. A detailed analysis of the trait terms used for the ten presidents in this study shows little if any evidence of partisan bias, but this in itself is not conclusive. If the Strauss-Howe model is valid, the early evidences that the United States has entered a fourth saecular crisis will become inescapably vivid over the ensuing ten years or so. Writing as early as 1991, they famously predicted a “Crisis of 2025” that may have seemed ludicrous at the time, but seems quite believable now. For instance, D’Souza (2014) offers the following analysis: “Decline does not always happen slowly. Sometimes it happens very quickly; then it is called collapse” (p. 3,497/4,781). “Talk to educated people outside the West and they sound as if the West is already finished; one of their stock phrases is ‘after America.’ The debate abroad is not over whether America will be done, but what will replace America” (p. 3,516/4,781). Strauss and Howe themselves present this chilling perspective: “The Fourth Turning could spare modernity but mark the end of our nation. It could close the book on the political constitution, popular culture, and moral standing that the word ‘America’ has come to signify” (1997, p. 331). Hopefully these dire scenarios will not come to pass, but if the Strauss-Howe model continues to hold true, we can expect certain trends within political (and presidential) culture. First, “strong” presidents inevitably emerge during the darkest days of a saecular crisis (Washington, Lincoln, FDR), as voters seek to invest high levels of power in a stern but visionary leader who can shepherd the culture across the looming chasm. If the model holds, we should again seek such a leader. (It should be noted that if a strong and charismatic but irresponsible leader emerges, the culture may be headed for disaster; it is no accident that at the same time that American voters chose Roosevelt as their leader, across the pond German voters were enthusiastically embracing Hitler.) Second, the culture is likely to tolerate presidential actions that at other times in the historical cycle would be seen as usurpations of power (for instance, Lincoln’s declarations of martial law and suspensions of habeas corpus, or FDR’s “alphabet soup” agencies and even his attempt to change the structure of the Supreme Court to safeguard his policies). Third, hard as it is to imagine in today’s political climate in which few moderate voices remain, political polarization should subside as both the left and the right need to find a way to come together to meet the growing threat and speak with a single voice. Often this leads to a time when American politics are dominated by a single political party and the opposing party becomes a marginal voice for a generation. In part this is because, as Strauss and Howe note, one of the four generational voices is largely stilled because its members are either too young or too old to have a significant influence on the wider culture, so America is always like a four-stroke engine running on three cylinders, or a car driving with one flat tire. A shift towards Intuition and away from Sensation is suggested by the Figure, and if these trends hold true, we may seek leaders who look at more long-term issues. America has a strong tendency toward short-term thinking, as suggested by the work of cultural analyst Geert Hofstede, but in times of looming crisis, we are probably most likely as a nation to balance out this tendency. This would lead to a full eighty-year pattern that would reflect the up-and-down sine wave pattern predicted by Strauss and Howe. If nothing else, we are living in memorable times. No one who lives through a saecular crisis ever forgets it; these are culture-shaping watershed events. It will be interesting to see if the next fifteen or twenty years validate this article, or consign it to the dustbin of history. Cahill, T. (1995). How the Irish saved civilization. New York, NY: Doubleday. D’Souza, D. (2015). America: Imagine a world without her. [Kindle 2012]. Washington, DC: Regnery Publishing. Embree, M. C. (2000). Historical cycles and personality type. Type Works (36), 6-8. Embree, M. C. (2013). Liberal and conservative values illuminated by the theories of Jung and Haidt. Personality Type in Depth (September). Fineman. H. (2008). The thirteen American arguments. New York, NY: Random House. Haidt, J. (2012). The righteous mind: Why good people are divided by politics and religion. New York, NY: Vintage Books. Hammer, A. L., and Kummerow, J. M. (1992). The Strong-MBTI® career development guide. Palo Alto, CA: Consulting Psychologists Press. Jung, C. G. (1953/1972). Two essays on analytical psychology (R.F.C. Hull, Trans.). Princeton, NJ: Princeton University Press. Jung, C. G. (1969). The structure and dynamics of the psyche (R.F.C. Hull, Trans.). Princeton, NJ: Princeton University Press. Jost, J. T. (2006). The end of the end of ideology. American Psychologist, 61(7), 651-670. Pearman, R. R., and Albritton, S. C. (2010). I’m not crazy–I’m just not you. Boston, MA: Nicholas Brealey. Pipher, M. (1999). Another country: Navigating the emotional terrain of our elders. New York, NY: Riverhead Books. Strauss, W., & Howe, N. (1991). Generations: The history of America’s future. New York, NY: William Morrow. Strauss, W., & Howe, N. (1997). The fourth turning: An American prophecy. New York, NY: Broadway Books. Taylor, P. (2014). The next America: Boomers, Millennials, and the looming generational showdown. New York, NY: Public Affairs. 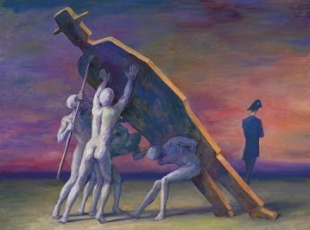 Wolfgang Lettl, “Der Kandidat” (“The Candidate”), (1996). Louis Abolafia presidential campaign poster, 1968. By permission of Louis Abolafia Campaign. 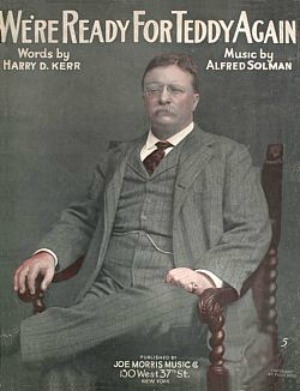 Theodore Roosevelt presidential campaign poster, 1904. Comments aren’t flooding in (though operators are standing by), but I’d be interested in whether readers think their own political (voting) choices have been driven by type. When you enter the voting booth, is your dominant function pulling the lever? My voting choices are very influenced by my dominant introverted intuition, in that I am always looking for the candidate who seems to have a sense of the bigger picture and the vision and courage to lead the country to find the “out of the box” solutions that are (to me) clearly needed. Of course, out of the box thinking is precisely what our modern presidential election process seems designed to cull out, so I am normally forced to choose the lesser evil—the candidate who seems least regressive. Barack Obama was the first candidate in a long time that I actually got excited about, because his speeches seemed to show an unusual ability to envision past the business as usual paradigm. I’ve been disappointed with him, though. Either I overestimated his vision or, more likely, the realities of the office have severely limited his ability to effect change. From Carol: I fit the profile of your article exactly, as do my parents. They were Adaptives (winter), Great Depression era types, and so were “conservative” and “risk-averse.” They also had sensation preferences. I am a Baby Boomer idealist and I have intuition-feeling preferences. My parents voted for conservative candidates and I have voted for liberal candidates. My dominant function is extraverted intuition and I voted for Clinton who is said to be dominant Ne. I also voted for Obama, who is probably an intuitive though his dominant function seems to be introverted thinking, given his cool thoughtfulness and detachment. But I believe I have voted for sensing candidates in local elections and I would vote for someone like Warren Buffett, a clear ISTJ. I have a principle not to vote for a candidate who demonizes his or her opponents, nor one who demonizes America’s enemies. It’s a fine line between debating and demonizing the opposition, but it can be seen in whether they use ad hominem arguments, and in whether they characterize the opposition as evil or immoral vs. misguided. I think of this principle as basic to Jungian psychology and thus beyond typology or politics but I know that many see it as a “liberal” principle. I experience some conflict between my (dominant) Fi and my (auxiliary) Ne. Ne is drawn to novelty and innovation and nuance, which tend to be the province of the left. But Fi is drawn (according to some theorists, and in my life as well) to the cherished values of the past (especially when supported by tertiary Si), which is the province of the right. I’m wondering if others experience a polarity between dominant and auxiliary when voting or when pondering politics. To Mark, and others as well. I was wondering how the archetypal roles plays out. I think most would agree that Obama utilise Ne as his first or second function and is very prevalent in his political discussion, the big picture talk, providing future direction, as well as, fierce debate coming from all angel and connecting the dots. I was wondering since Obama Ne is so strong in his political discussion, shouldn´t that create in a sense a opposing tensional force for Introverted Intuitive types considering Ne is in the opposing archetypal position according to John Beebe´s theory? Re Obama’s “Ne” language: It is true that there is opposition between extraverted intuition and introverted intuition, and so if Obama has an Ne preference, either as dominant or auxiliary function, then introverted intuitives could perceive him as being insufficiently committed. To Editor, thanks for the reply, you said ´could´. I mean what would be the triggering point to fall into the archetypal role? Superb article. I really appreciate you putting this together and your keen eye for detail and political and typological nuance. It will be interesting to see if the political consulting class ever try to use more typological modalities for politicians. 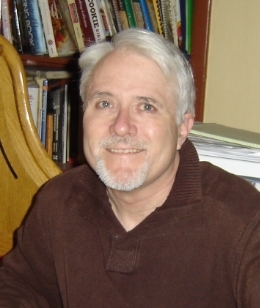 Marlowe C. Embree (INFP), Ph.D., is Associate Professor of Psychology at the University of Wisconsin-Marathon County, where he developed psychology courses in the areas of careers, religion, death and dying, and leadership. He also heads a consulting firm specializing in soft-skills training, outplacement, and employment interventions. He is the author of the book, Self-Managing Your Career, and was named a Wisconsin Idea Fellow in 2004 and SGA Professor of the Year in 2011.